The future, now. | Pau’s blog — an open dialog on vision, innovation and technology. Pau’s blog — an open dialog on vision, innovation and technology. Yuhuuu! Researchers have stated demostrating that we can print live tissues… next step is to print people!!! Why not a “mini-me“?? One of PopSci’s favorite regenerative medicine specialists, Anthony Atala, printed a biocompatible model of a human kidney on stageat the 2011 TED conference Thursday, in a technique that could someday be used to create new organs from a patient’s own tissue rather than relying on donated organs. “It’s like baking a cake,” Atala said. Well, it looks like these days we can “print” virtually anything!!! These MIT researchers are developing a technique to print solar cells! What about printing textiles with a solar cell to recharge your smartphone? What about covering your house with fabrics so that they are sustainable? What about…Possibilites are endless!! Watch out this cool video on designing furniture on the fly. A nice combination of 3D capture, rapid prototyping and great sales video 😉 — from inventorspot. In the path of making computer interfaces more natural, the Publicis & Hal Riney website proposes a very interesting method: navigate throught their website only with the webcam, without the need of a mouse. It suffices to stand at a certain distance of the camera and wave your arms to select the right and left directions. In the information society we live in, sometimes we loose original names and concepts by dehumanized incomprehensible codings. In this line, the post “An online color thesaurus” permits to specify colors in natural language and to find out which is the corresponding RGB webcolor. And you can also collaborate enlarging their database! Oh, my God… It looks like BS is severely spreading to video resumées!! Check out Esquire’s post on The Worst Video Resumes Ever for some pearls. You can’t miss it! For some reason, engineers tend to value more complex solutions than simple ones. 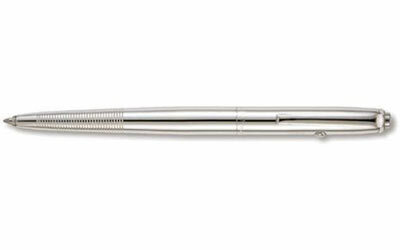 You might have probably read the rumor of the space pen. In short, NASA developed a pen that could write in zero gravity, spending $12M and thousands of hours of work, while Russians used pencils instead. Although the story is simply a hoax, it well illustrates a principle seen in many engineering decisions: simple solutions are undervalued. High-tech, high-complexity solutions are seen as the correct ones by whole communities of experts, even if simple solutions might be just better. So, which are the stories of your own? Which are the pencils that can be used instead of pens?